The Boston Red Sox 2004 season was the 103rd Major League Baseball season for the Boston Red Sox franchise. Managed under Terry Francona, the team finished with a 98–64 record (three games behind the New York Yankees in the American League East Division). The Red Sox played in Fenway Park to a total attendance of 2,837,294 fans. 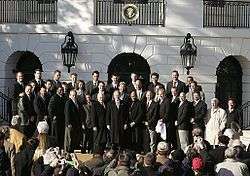 They clinched the AL wild card to assure a berth in the 2004 post-season. They swept the Anaheim Angels in the first round to enter the American League Championship Series against the Yankees for the second straight year. As Boston entered the fourth game of the ALCS, they had fallen three games behind the Yankees, including a Game Three loss by the score of 19-8. Trailing 4-3 in the 9th inning of Game 4, they embarked upon an unprecedented (in Major League Baseball) comeback from a three-game deficit to defeat the New York Yankees in the series. After the ALCS, the Red Sox swept the St. Louis Cardinals to win their first World Series since 1918 (86 years). Major League Baseball, the National Basketball Association, and the National Hockey League are three professional sports that feature best-of-seven games series in their playoffs. Coming back to win a seven-game series when down by three games has only been accomplished by five teams in the history of the MLB, NBA, and NHL. The 1942 Toronto Maple Leafs (NHL) came back from being down by three games to the Detroit Red Wings to win the 1942 Stanley Cup. The 1975 New York Islanders (NHL) did the same when they came back to beat the Pittsburgh Penguins in the 1975 Stanley Cup Quarterfinals. During their Cinderella run to the 2010 Stanley Cup Finals, the Philadelphia Flyers (NHL) came back from three games down to defeat the Boston Bruins to advance to the Eastern Conference Finals. In the 2013–14 NHL Playoffs the Los Angeles Kings defeated the San Jose Sharks in the first round, on their way to the 2014 Stanley Cup Finals. The Boston Red Sox are currently the only team in Major League Baseball history to do this. ↑ "2004 Boston Red Sox Statistics". Baseball Reference. Archived from the original on June 9, 2007. Retrieved May 2, 2013. ↑ Abraham, Peter (August 15, 2013). "A Red Sox 2004 Series ring up for grabs". The Boston Globe. 1 2 3 "Statmaster: A baseball Team Statistics Tool". Baseball-almanac. Retrieved May 2, 2013. ↑ "2004 League Division Series". Retrieved May 2, 2013. ↑ Curry, Jack (October 28, 2004). "Kiss That Curse Goodbye". The New York Times. p. D1. 1 2 Shapiro, Leonard (February 7, 2005). "Patriots Grab Share of NFL History". Washington Post. p. A1. Retrieved December 10, 2010. ↑ Shaughnessy, Dan (June 17, 2011). "How great is this?". The Boston Globe. Retrieved June 29, 2011.